We have been having some rain and cool weather for most of this month so it has been enjoyable to bake things. The cooler weather has also allowed my tulips to stay around much longer than usual, so I have been able to enjoy first some yellow and lavendar ones, then pink and red ones and now the later yellow ones while still having the pink ones looking good. The only downside is that the ground has stayed cool, too. I did plant out some zucchini squash plants that had gotten too big to stay indoors. They seem to be OK but I don't expect much growth from them for a while until it warms up some. 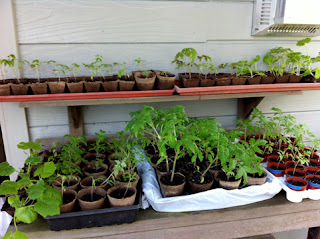 I have dozens and dozens of tomato seedlings so I hope it warms up soon so they can get planted, too. My recently planted rhubarb plant looks pathetic but a friend has been generous with stalks of her gorgeous rhubarb so I've been enjoying this plant that always reminds me of spring. 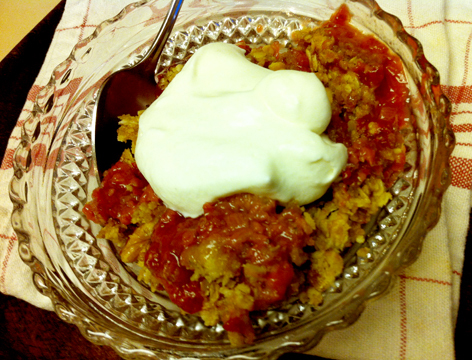 Although rhubarb cut up and cooked with a little sugar is a fine thing all by itself, it also lends itself to a very Irish dish, the rhubarb crumble. I suspect that this is also a very British dish and who knows how many places enjoy it for 'pud'. The lovely thing about it is that it is quick and simple and delicious, too. 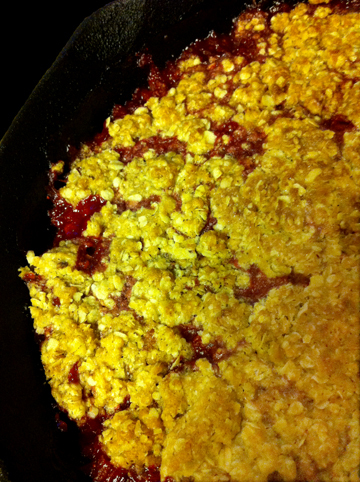 Place the rhubarb and water, plus sugar as needed, into a shallow, wide ovenproof pan...I use our cast iron skillet. Cover and cook the rhubarb for 20 minutes at medium heat. While rhubarb is cooking, preheat oven to 375 degrees F.
When the rhubarb has cooked for about 10 minutes, make the crumble: In a medium bowl combine the flour, brown sugar, oats, salt and nutmeg. Work in the cold butter with your fingertips or use a pastry blender or two knives, until the mixture is crumbly and clumpy. Uncover the pan and crumble that mixture evenly over the hot fruit. Bake in the preheated oven for 12-15 minutes or until crumbs are golden brown. Serve while still warm. Good with a garnish of whipped cream. Love rhubarb. Didn't see much here this year. I fear we're already into the summer at we're seeing 80"s pretty regular now. 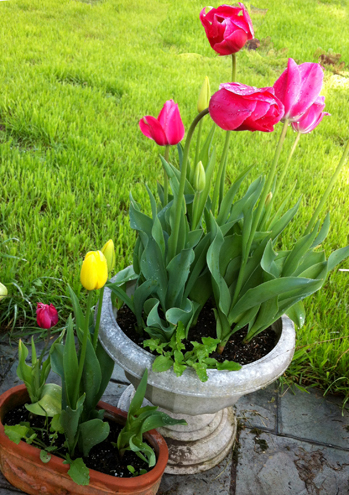 It would be lovely if I could enjoy your cool, tulips and some of this "pud". Babes Bake Beer Bread - Eh?